If you are looking for my SCRS November Preview, please scroll down. Thank you! Hello and Happy Friday! Welcome to the Taylored Expressions November Spotlight Day! Everything that we have been previewing are now available in the TE Store! Here's a link to all new products: Fresh Out of the Oven! 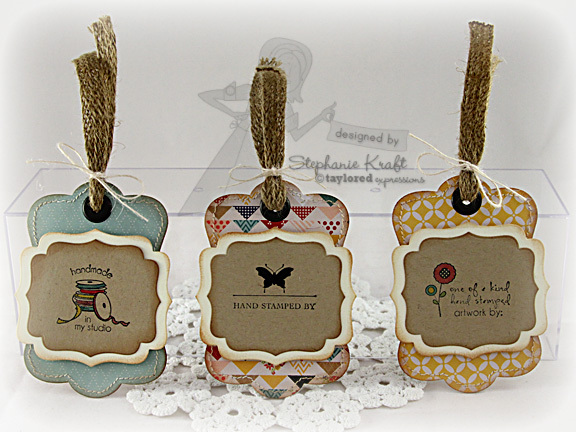 Today I am focusing on Signature Style, the newest addition to the TE Sampler collection. It contains illustrations from all of the TE illustrators! It is the perfect way to sign the back of your cards, or in this case, I made tags with a few of the images. For my set of 6 tags, I used the Frame it Up 1 Die as my base. I started by die cutting a base of Kraft cardstock and patterned paper. I stitched around the patterned paper, then I adhered it to the base (so the stitching wouldn't show on the back side. Next, I layered two sizes of the new Labels Stacklets 2 and popped it with foam tape over the tag base. 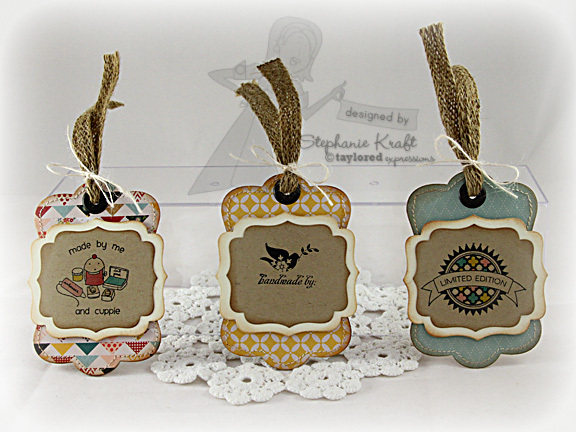 I added some burlap ribbon and twine to complete my tags. Accessories: Taylored Dies: Labels Stacklets 2, Frame it Up 1 (Taylored Expressions); Markers (Copic), Burlap ribbon, Twine (May Arts); Brads (WRMK), Foam tape, Thread, Sewing machine. Love all of the tags!! What a great idea to make a batch of these to have on hand. SO pretty!! These are gorgeous Stephanie! I need to make a set of these for myself and my mother in law. I LOVE that ribbon you've used at the top... wow! WOW Stephanie! What a wonderful collection of tags! Love the pretty die cut layered shapes!